Dal Tadka is a very popular lentil dish and is a regular fare at restaurants. Typically made of cooked toor/arhar dal or a mixture of toor and masoor, this dish is typically served with rice or as a side dish with the main course. The regular dal I make to go with rice is generally thin and light. However, since DH is a big fan of restaurant style tadka dal, this also makes an appearance on our menu every now and then. Lentils are protein-rich and are a must include in a vegetarian diet. For Dal Tadka, the lentils are first cooked and once it is cooked, it is tempered with ghee and spices which takes the taste of this dal to another level. After a month break from the blogging marathon, I am here with this Tadka Dal recipe for Week2 Day 1 under the ‘Dazzling Dals’ theme. To tell you the truth, the month of May has been going very fast for me. It was only when I saw Valli’s post in my mail; I realized that I did not have my posts ready. But, thankfully making dal is an everyday thing in my house and I am sure all my posts under the theme will be up, but maybe late by a day. I am also surprised that the only dal recipe I have on the blog is that of Dal Makhani. So, this theme is an opportunity for me to update this space with some nice and dazzling dal recipes. And the first one among the 3 I will be posting is this. Let’s check out the recipe for Restaurant Style Tadka Dal now. 1. Wash and rinse the dal with water 2-3 times before soaking it in fresh water for at least 30 minutes. 2. Take a pressure cooker (3 litres capacity is good), add the onion, tomato, ginger, garlic, green chilli, cloves, soaked dal (discard the water it was soaked in), salt, turmeric powder, ghee and add 2 cups of water. 3. Cook it on medium to high heat for 5 to 6 whistles. Once done, let the pressure settle on its own. Open the lid and whisk the dal smooth. 4. In a tadka pan, heat ghee. Once the ghee is heated through, add the bay leaves, asafetida, and cumin seeds and whole red chilli. When the cumin starts crackling and changes colour, add the red chilli powder and immediately pour the tadka over the cooked dal. Stir and serve hot with rice. This Restaurant Style Dal Tadka recipe is my entry for BM 88 Week 2 Day #1 under the theme 'Dazzling Dals'. Dals are easiest dishes to dish out and the tempering on this dal adds an amazing flavour to it. I would love to have this with rice and a dollop of ghee.. 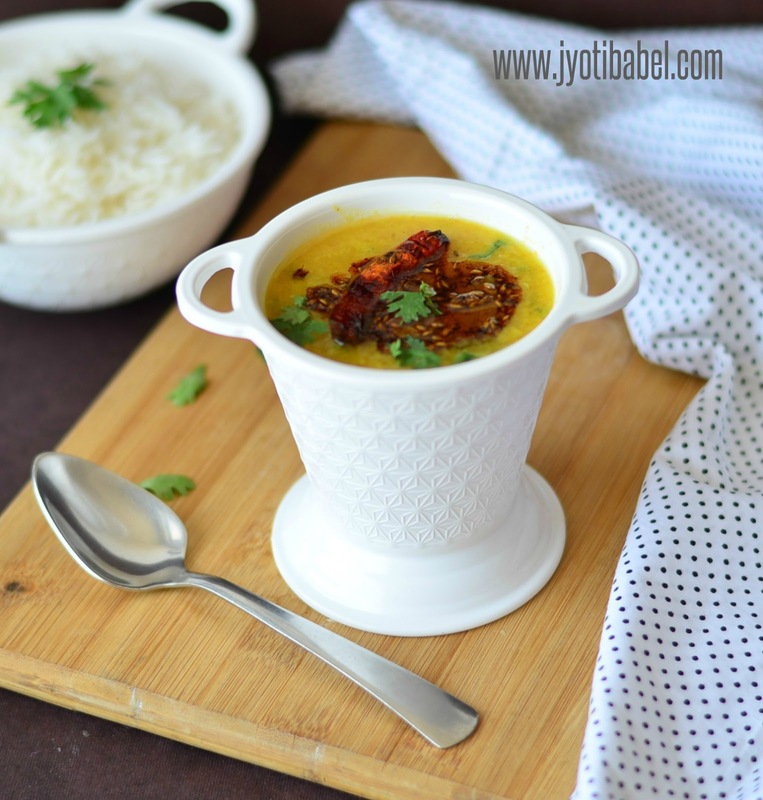 Such a comforting dal tadka, nothing can beat this fabulous dal. Love it to the core. My kind of food. Delicious share one of the "bestest" dals a person can eat. Such a comforting dal and the pic is superb. A very comforting dish and one that frequents our home as well. :) Nice picture. Love the varieties in all the dals. The Dal container look so pretty. All time comfort food... piping hot tadka dal and some rice. I love to have it with some ghee topped on it. 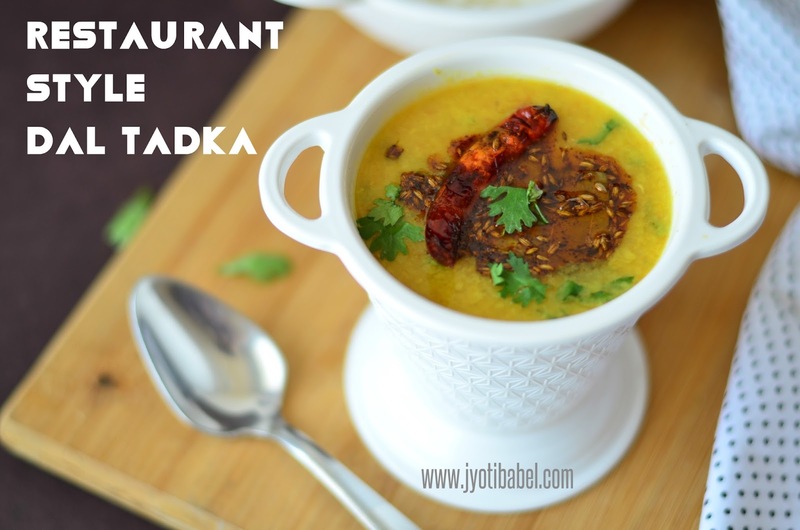 Ah such lovely click you got there Jyothi, dal tadka is my favorite anytime!..and obviously a great pick for this theme. Such a classic dish and so easy to prepare yet hearty! Love your serve-ware.Beautiful clicks Jyothi. Dal tadka looks amazing. Such a comfort food. I love this comforting yet so delicious restaurant style dal tadka with some hot chapatis. Very comforting and healthy recipe for day to day meal.